Radisha has been an important part of my team for years! I have often said that my ideas are really unfulfillable without my treasured “team”. One of my favorite team members has and will always be my dear friend and talented artist Radisha. fainted! He was at the time a Canadian citizen and was born in Serbia then studied art in Canada. We have been working together on countless projects ever since. He is skilled in many styles of painting, as you will see in the following pictures. One of my favorite things in his art is his sense of whimsy! Radisha has the ability to carry his artwork beyond the canvas to many different applications. techniques to always create a beautiful end result! This is a four-panel screen in a Renaissance style. Pictured above is a painted mural Radisha created on a blank wall. The curtains matched the dining room curtains which is to the right through an archway! The house is an Italian Villa by Reginald Johnson; so the view is of the countryside in Tuscany. the water color renderings of the gallery the afternoon before); she said…… “Oh! I said, “Well; when I didn’t hear from you, he painted it all last night! Fortunately, the whole family loved it all!!! painting and details painted around sconces, etc. are still (27 years later) a beautiful feature of the house. like Radisha to make such a difference in a project! Monterey Colonial Restoration in Montecito: "The Before!" were moving back this fall; and wanted to buy their “first house” ! Time to buy their first house! Yikes! I have looked at just about every family house in Montecito! And I saw some wonderful houses “dying on the vine” because of the colors, the furniture, and also, the “tile”! The truth is, most people cannot “visualize”! They see what is there; they cannot see what “can be”! I thought I found one I thought was “perfect”!! The key for me is this……a good size for five; and still a good size for two! That is what I saw when I saw this house! This is the “before”! This is the former owner’s furniture. This is how I saw it the first day! I am particularly fond of an architectural style known as “Monterey Colonial”. with an adobe with a second story and a balcony across it. One of the first houses in this style is the famous “Larkin House” in Monterey; pictured below. How perfect this looks to me! The pitch of the roof….all of it! I think this is beautiful! Built in the early 1800’s! and greatly enlarged her decorating practice because she did such a good job. and her partnership with her brother, David Adler! Such a happy story! One of the hallmarks of this architecture is the second-floor balcony. Frances Elkins bought Casa Amesti in 1918. She took a “falling down wreck” and with her brother, the architect David Adler, turned it into the “showplace of northern California”! It was largely because of her that this style of architecture became very popular, in California particularly. house; she had a following all over the United States……California, the midwest and the East! She decorated most of “Pebble Beach”; one of the loveliest residential areas in California. She was “the” California decorator in the twenties, thirties, and forties!! San Francisco, Pebble Beach, around Lake Forest in the midwest, and back east……..(she was the “IT” girl) in terms of decorating! And she kind of “started Monterey Colonial”! She set it “on fire”! I grew up in Pasadena, California, and the “Monterey Colonial” was a very popular style there. and California; the twenties, thirties and forties. Reginald Johnson, Gordon Kauffman, and George Washington Smith. Here are a few in the neighborhoods in Pasadena. As you see here, the traditional colors are cream or white, with white railings and dark shutters. Black-green or black blue. And , please note most have “real working shutters”; not skinny stuck on fake ones! Imagine my surprise to see this “Monterey Colonial” in Montecito!! I love, love the architecture; it was designed in 1934 by Joseph Plunkett, a very famous architect in Santa Barbara. You can’t tell very well; but the house was pink! With turquoise shutters! Even the non-traditional colors could not hide the beauty of the architecture! The lovely balcony goes across the front of the house and there is a curving stairway up to the balcony over to the right. 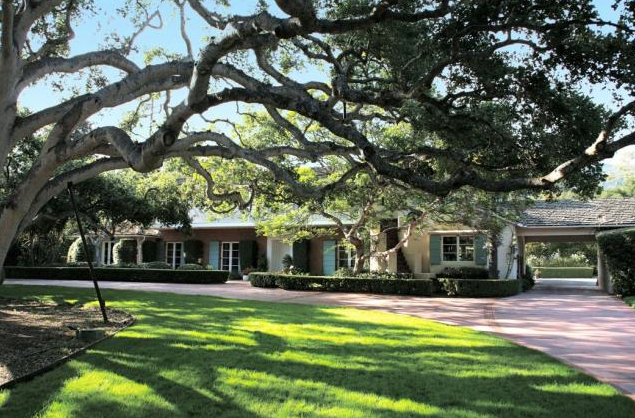 Three magnificent oak trees span the entire front. These trees go along the ground . seen trees this magnificent……and they have been lovingly maintained for 77 years! 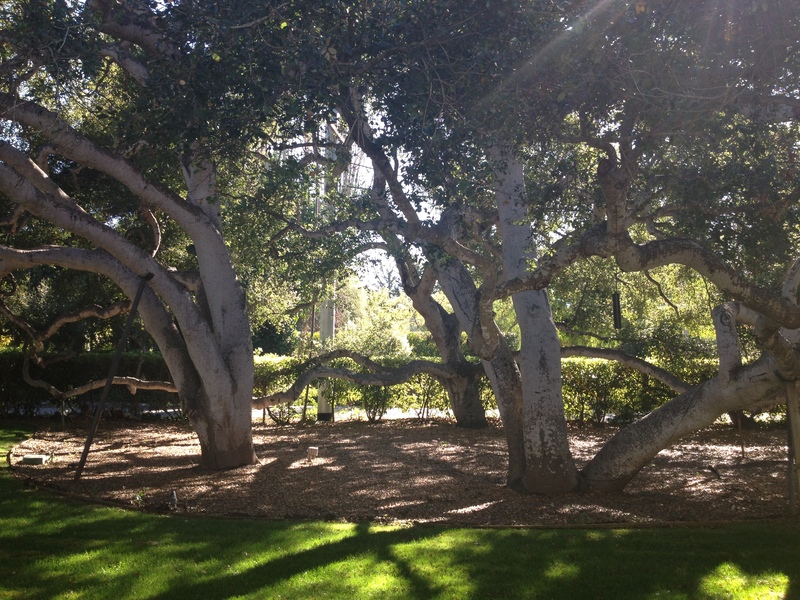 These trees are over one hundred or one hundred and fifty years old! In California……this is a serious rarity! So; I fell in love in the driveway; then I go to the front door! I walk into the central entrance hall and I see the sky!! The oval entry hall I fell in love with at first sight! to the antique fireplace in the gorgeous paneled library! The house is “one room deep” which is very unusual, and creates both north and south exposures in many of the rooms. This is the living room; to the left of the entry, and beyond it is the library. French doors open to the front terrace and the back. Two pairs each, directly across from each other! This is the gorgeous paneled library at the end of the left side of the “rectangle”. If you turn to the right in the entry hall; you enter the dining room, butlers pantry, kitchen, breakfast room. and a pair of French doors opening to the front terrace opposite them. turned into a “breakfast area and laundry room.Also with north and south windows! Santa Barbara is; so it is a “south facing coast”! and garden. They “opened in” which was a huge problem in the floor plan. We turned them around……I noticed on the “plans” for the remodeled kitchen……they were supposed to open “out”! Back to the entry hall………….and ………..Up the stairs we go! At the top of the stairs; turn to your right; and a hallway with closets leads to the master bedroom! It has three exposures! Windows facing west, north, and French doors facing south and leading onto the front balcony! 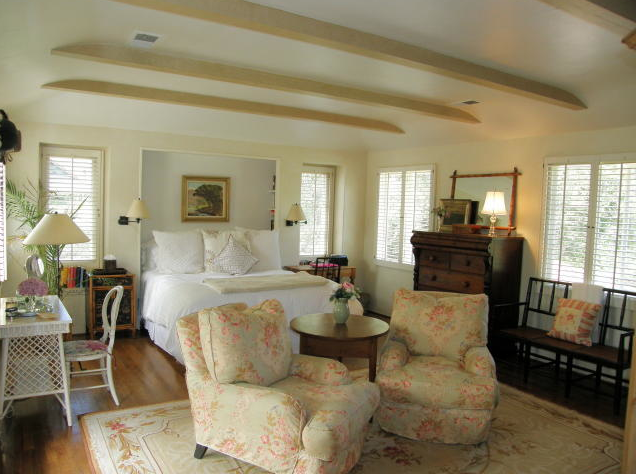 felt very crowded..I just had to eliminate the furniture in my mind…….lovely room. Lose the fake beams! Even with the heavy shutters, the light was incredible! I do often encourage my clients to use plain tile because it is permanent and difficult to change. It made me dizzy! And it was in two entire bathrooms; floors and walls! this was the master; the other one, downstairs off the library! Now….at the top of the stairs……turn left……(it is so lovely to have a central hall in the middle of the house..
this is a “classic” because it is ‘calming’ and feels wonderful from the second you walk into the front door. So much of “architecture and design is ‘visceral’ and there is a reason that central hall houses are comfortable and lovely! It all makes sense! This house had been on the market for awhile…..but was very difficult to show. It was rented out as a “vacation rental”! Turn to the left and a hallway leads to two bedrooms that share a dressing room and bath. This room felt small with all the furniture in it; but I knew it wasn’t! This dressing room is shared by two bedrooms, and also a bath! Great closets! this is the shared bathroom…….this tile was much more palatable……..
but when I learned all the tile in the bathrooms was 35 years…….no. we cannot paint….that is too long! The tile had to go…….in all 3 bathrooms! It was the right thing to do! This is the “girl’s bathroom! Brooke taught me about “pool plaster”! It is so genius! And it looks so divine! And we got rid of this tile…….we did “pool plaster” on all the walls…..replaced the “louvered” door with a solid door….put in a cabinet with a sink……..
All these changes are happening right now….wait till you see! Steve Giannetti designed a delightful “playroom” and guest room and bath in the garage to the left of the “porte-cochere” Genius! and he wrote on the plans “any chance of a cathedral ceiling in here?” on the porte-cochere! And we did it! Brooke showed our plasterer her bathrooms in Oxnard done entirely with “pool plaster”! Thank you, Brooke and Steve! Here is a view of the lovely balcony across the front of the house! and here is a view of the “secret” lap pool on the left (west) side of the property behind a hedge! and this is the view from the house……and all the rooms……this amazing garden and lawn! The pool is behind the hedge on the left……behind the hedge on the right is an amazing orchard and rose garden. this is the most lovely house! I described it to them and sent photos of this beautiful classical house! It is nothing short of a miracle……really………It has unfolded as the most beautiful house I have ever seen! The shutters were “boxes” around lovely moldings around the windows; and there were “double key locks’ on almost every door inside and out..
At the end of the day; the house is exquisite…….incomparable, unimaginably beautiful….and I cannot wait to post the after! Get your smelling salts ready!